uary 2012, 20 patients were consecutively included. difficulties, pain or analgesic consumption was found. 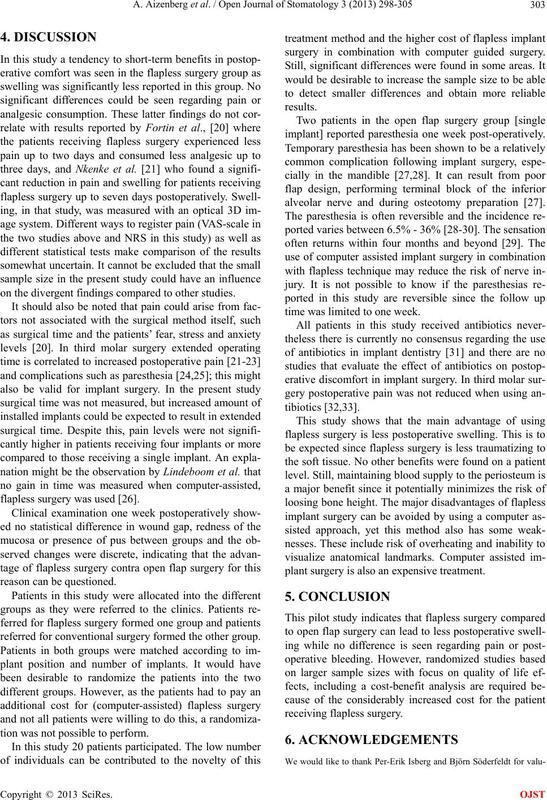 discomfort between the two surgical techniques. computed tomography (CT) scan, has been developed. gery and includes the use of a surgical template [5,17]. months , but there are no long-term follow-ups . all participants. The patient selection was consecutive. gender and age were seen between the groups. from the scan was processed in the planning software. used for all flapless incisions. ties 24 hours, three days and seven days postoperatively. 3. Did you experience swelling in the operated area 24 hour s after surgery? 4. 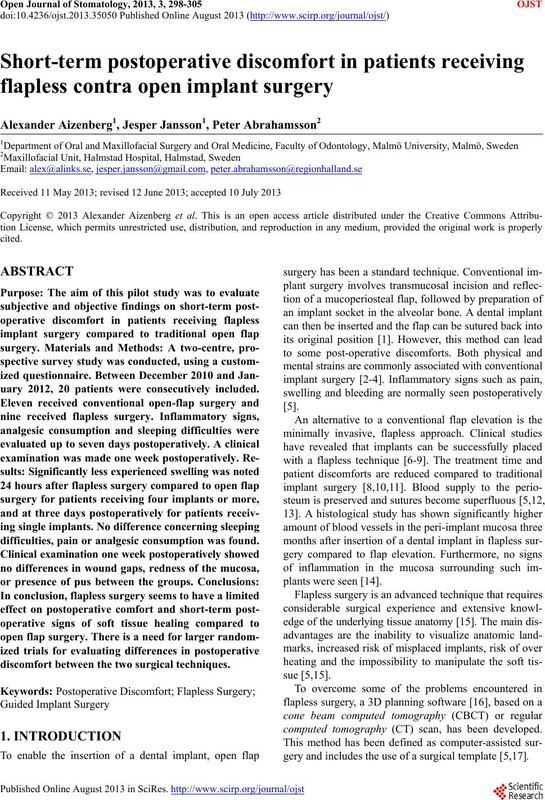 Did you experience bleeding from the operated area 24 hours after surgery? 6. Did you use any pain killers 24 hours after surgery? 7. 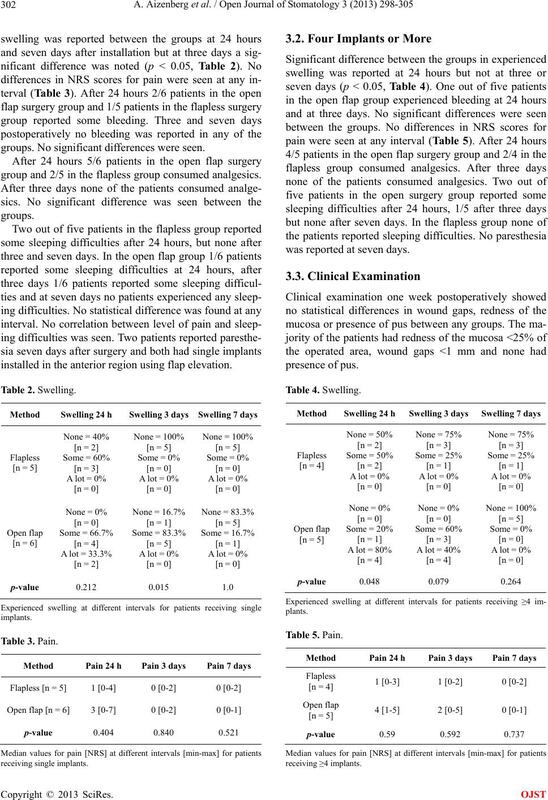 Did you experience difficulty sleeping 24 hours after surgery? Figure 1. 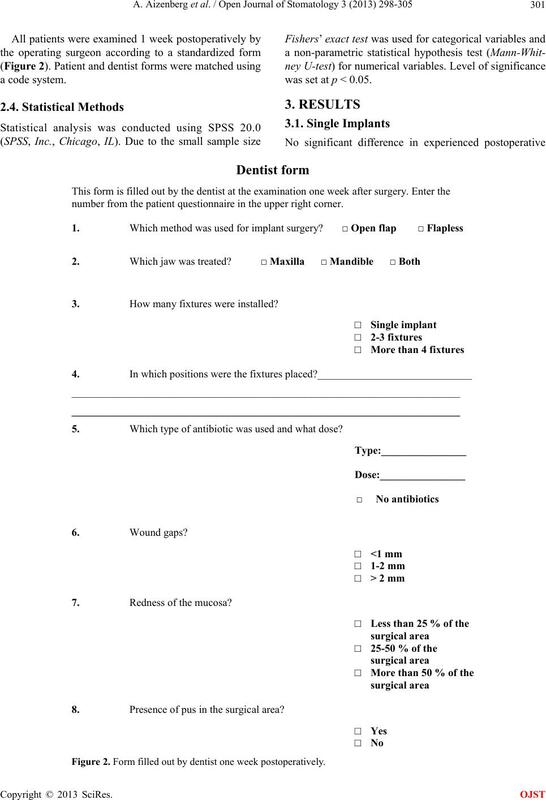 Questionnaire used by patient at 24 hours, three and seven days postoperatively in accordance. was set at p < 0.05.
number from the patient questionnaire in the upper right corner. 3. How many fixtures were installed? 5. Which type of antibiotic was used and what dose? 7. Redness of the mucosa? 8. Presence of pus in the surgical area? Figure 2. Form filled out by dentist one week postoperatively. groups. No significant differences were seen. group and 2/5 in the flapless group consumed analgesics. installed in the anterior region using flap elevation. was reported at seven days. on the divergent findings compared to other studies. flapless surgery was used . referred for conventional surgery formed the other group. tion was not possible to perform. surgery in combination with computer guided surgery. implant] reported paresthesia one week post-operatively. alveolar nerve and during osteotomy preparation . time was limited to one week. plant surgery is also an expensive treatment. able help with questionnaire design and statistical analysis. 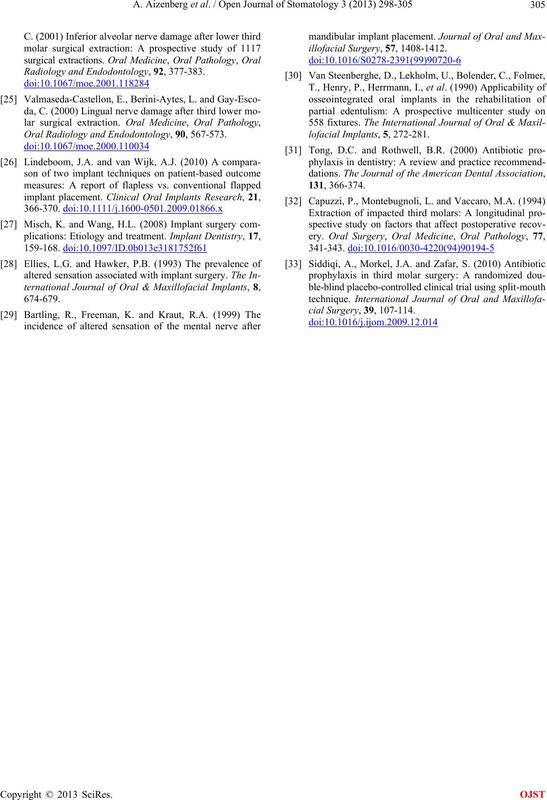 tic and Reconstructive Surgery Supplementum, 16, 1-132. Al-Khabbaz, A.K., Griffin, T.J. and Al-Shammari, K.F. 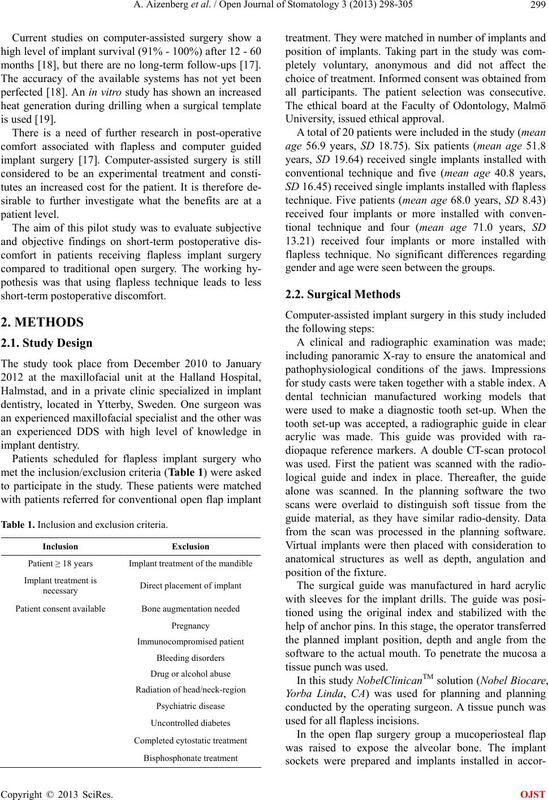 Oral & Maxillofacial Implants, 23, 867-875.
pean Journal of Oral Implantology, 1, 293-304.
tistry and Related Research, 7, S111-S120. nal of Oral Rehabilitation, 34, 835-840. & Maxillofacial Implants, 24, 118-125.
nal of Oral & Maxillofacial Implants, 18, 886-893. Kim, J.I., Choi, B.H., Li, J., Xuan, F. and Jeong, S.M. nal of Oral and Maxillofacial Surgery, 65, 20-32. Schneider, D., Marquardt, P., Zwahlen, M. and Jung, R.E. Eli, I., Schwartz-Arad, D., Baht, R. and Ben-Tuvim, H.
molar. 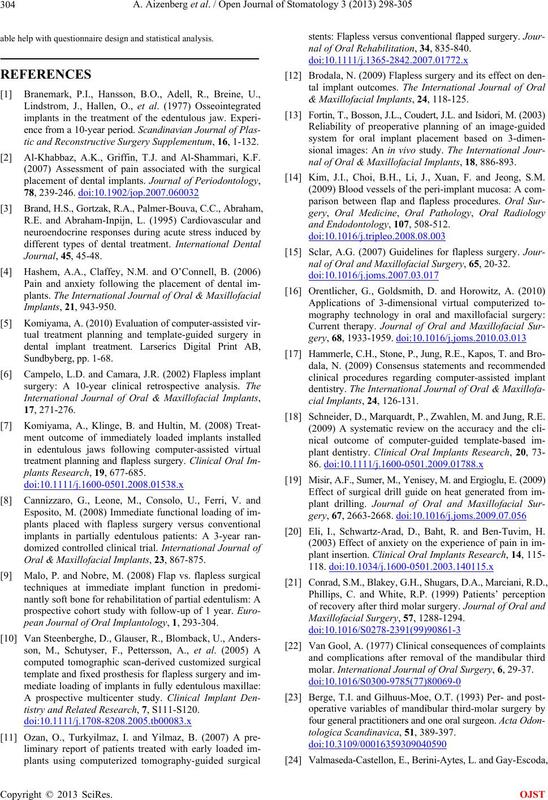 International Journal of Oral Surgery, 6, 29-37. Radiology and Endodontology, 92, 377-383. Oral Radiology and Endodontology, 90, 567-573.